Diglyphus spp. wasps are promising biological control agents for agromyzid leafminers (Diptera: Agromyzidae). The species occurring in North America are Diglyphus isaea (Walker), Diglyphus begini (Ashmead), Diglyphus websteri (Crawford), Diglyphus intermedius (Girault), Diglyphus pulchripes (Crawford) and Diglyphus carlylei (Girault) (Lasalle and Parrela 1991, Stegmaier 1972). Figure 1. Adult Diglyphus sp. on a bean leaf. Larvae in this genus are external parasitoids of dipteran leafminers. Photograph by Jian Li, University of Florida. This genus of leafminer parasitoids occurs widely in Asia, Europe, North America, New Zealand and Northern Africa (Minkenberg 1989). 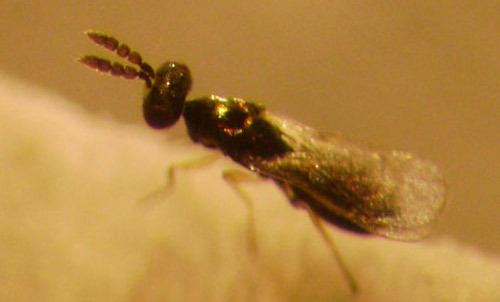 Adult: The adult parasitoid is a tiny wasp 1.5 to 2 mm long, depending on the species. The head, thorax and dorsal abdomen are generally metallic green in color, while the eyes are red. 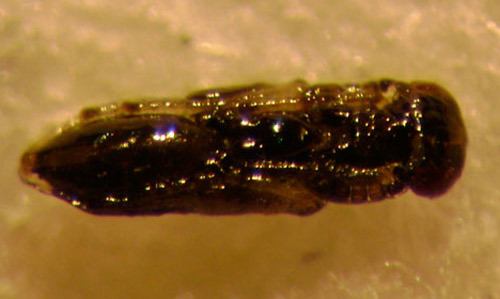 The scutellum has two pairs of setae, a submarginal vein with more than two dorsal setae, and the funicle is 2-segmented (Lasalle and Parrell 1991). Figure 2. Adult Diglyphus sp. on a bean leaf. Larvae in this genus are external parasitoids of dipteran leafminers. Photograph by Jian Li, University of Florida. Egg: The adult female Diglyphus parasitoid stings the dipteran host larva to paralyze it. Then the female may lay one or more eggs on the late instar leafminer larva (Minkenberg 1986). Larva: The parasitoid larva has three instar stages. The first instar larva is transparent, whereas second and third instars are yellowish. 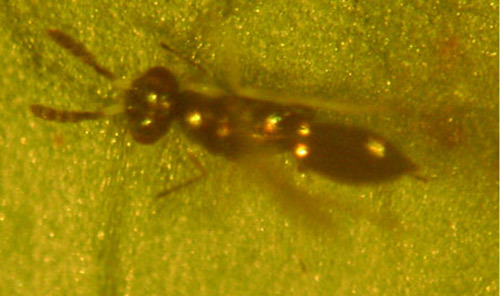 The parasitoid larva feeds externally on the leafminer larva, eventually killing the host. The parasitoid larva then pupates in the leaf mine before emerging as an adult. The development time is temperature dependent. Diglyphus isaea takes about 10 days at 25°C for complete development on both the American serpentine leafminer, Liriomyza trifolii; and the pea leafminer, Liriomyza huidobrensis (Bazzocchi et al. 2003). Figure 3. Diglyphus sp. larvae, 1st, 2nd and 3rd instar respectively left to right. The larvae were removed from the mine of a bean leaf. Larvae in this genus are external parasitoids of dipteran leafminers. Photograph by Jian Li, University of Florida. Figure 4. Parasitoid Diglyphus sp. 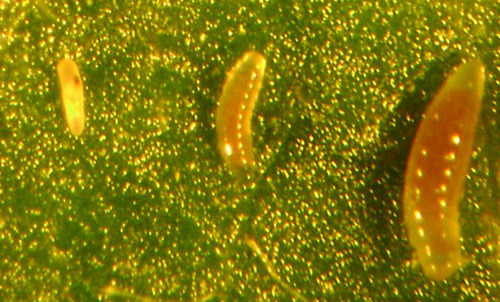 larva (top) feeding on a leafminer larva. 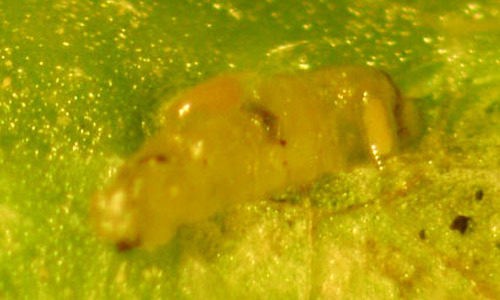 The larva was removed from the mine of a bean leaf. Larvae in this genus are external parasitoids of dipteran leafminers. Photograph by Jian Li, University of Florida. Figure 5. Two parasitoid Diglyphus sp. larvae (one is feeding horizontally on top, the second is positioned vertically to the right side of the larger host larva) feeding on a leafminer larva. 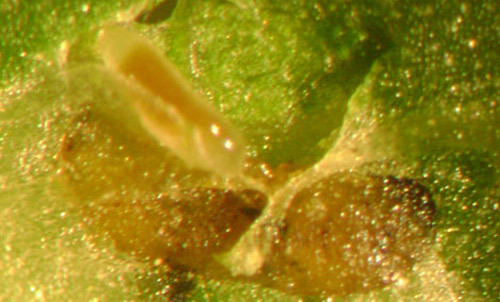 The larvae were removed from the mine of a bean leaf. Larvae in this genus are external parasitoids of dipteran leafminers. Photograph by Jian Li, University of Florida. Pupa: The third instar larva pupates in the leaf mine. The pupa is initially both transparent and light green, but eventually turns black. Figure 6. Early stage of pupa of a Diglyphus sp. showing transparent and light green color, and red eyes (on right). 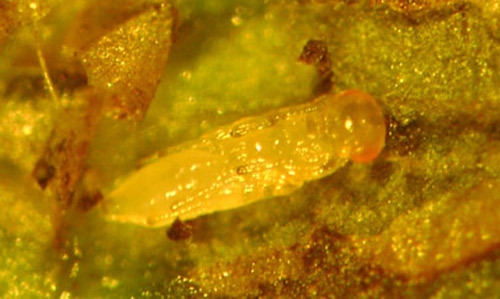 The pupa was removed from the mine of a bean leaf. Larvae in this genus are external parasitoids of dipteran leafminers. Photograph by Jian Li, University of Florida. Figure 7. Late stage of pupae of Diglyphus spp. turn black in color. In this image the head is to the right. Larvae in this genus are external parasitoids of dipteran leafminers. Photograph by Jian Li, University of Florida. Diglyphus spp. are primary ectoparasitoids of dipteran leafminers in the family Agromyzidae. However, a Diglyphus sp. was also recorded parasitizing Lepidoptera (Lyonetiidae) larvae (Boucek and Askew 1968). Augmentative release of commercial Diglyphus spp. is used for controlling leafminers in greenhouses in North American and Europe. Bazzocchi et al. (2003) indicated that Diglyphus isaea parasitized at least 18 different agromyzid species. Diglyphis isaea is the most effective commercial biological control product for controlling the American serpentine leafminer, Liriomyza trifolii; the pea leafminer, Liriomyza huidobrensis; Liriomyza bryoniae; and the chrysanthemum leafminer, Phytomyza syngenesiae (Syngenta-bioline). Lasalle and Parrella (1991) indicated that Diglyphis begini also parasitizes Liriomyza trifolii, Liriomyza huidobrensis and Liriomyza bryoniae in North America. Kaspi and Parrella (2005) reported that the insecticide Abamectin has little impact on Diglyphis isaea adults or the larvae within the leaf mines of chrysanthemums. Boucek Z, Askew RR. 1968. Palearctic Eulophidae (excl. Tetrastichinac). (Hym. Chalcidoidea). Index of Entomophagous Insects. La François, Paris. 260 pp. Bazzocchi GG, Lanzoni A, Burgio G, Fiacconi MR. 2003. Effects of temperature and host on the pre-imaginal development of the parasitoid Diglyphus isaea (Hymenoptera: Eulophidae). Biological Control 26: 74-82. Kaspi R, Parrella MP. 2005. Abamectin compatibility with the leafminer parasitoid Diglyphus isaea. Biological Control 35: 172-179. Lasalle J, Parrella MP. 1991. The chalcidoid parasites (Hymenoptera, Chalcidoidea) of economically important Liriomyza species (Diptera, Agromyzidae) in North America. Proceedings of the Entomological Society of Washington 93: 571-591. Minkenberg OPJM. 1989. Temperature effects on the life history of the Eulophid wasp Diglyphus isaea, an ectoparasitoid of leafminers (Liriomyza spp. ), on tomatoes. Annals of Applied Biology 115: 381-397. Minkenberg OPJM, Van Lenteren JC. 1986. The leafminers Liriomyza bryoniae and L. trifolii (Diptera: Agromyzidae), their parasites and host plants: a review of Agriculture. University of Wageningen Papers 86: 1-50. Stegmaier CE. 1972. Parasitic Hymenoptera bred from the family Agromyzidae (Diptera) with special reference to south Florida. Florida Entomologist 55: 273-282. Syngenta-bioline. Dig-line i: Leaf miner control. Syngenta Bioline Limited. (20 December 2010). Publication Date: December 2010. Reviewed: August 2018.